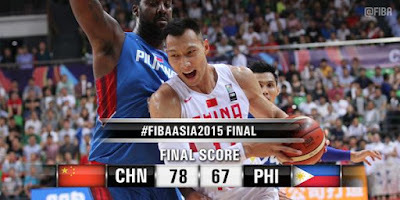 This is the full video for the FIBA Asia Championships 2015 Final: Gilas Pilipinas vs. China as China triumphs over Gilas Pilipinas as Pinoy netizens slam dirty tricks and biased officiating. Honestly, I don't see there's big problem with the referees. But I do see some big problems in the Philippines team, like 1. huge mismatch in transitional differences; 2. weak 3 points guarding, especially on the weak side area; and 3. lack of variety attacking plays (all I can see is 1. isolating Blatche; 2. Guards cut in and out; 3. Guards drive in and shoot). And as far as I can observe, those Philippines players are very hot blooded, lack of patience to run offensive plays. They might have good skills, but their basketball IQ are relatively low. It is not a fair game! It is a shame to the Chinese people. Even the NBA 24/7 in Facebook says "If you want to watch a legit cooking show. Go and watch FIBA Asia, China vs Philippines. The refs cook better than Harden." 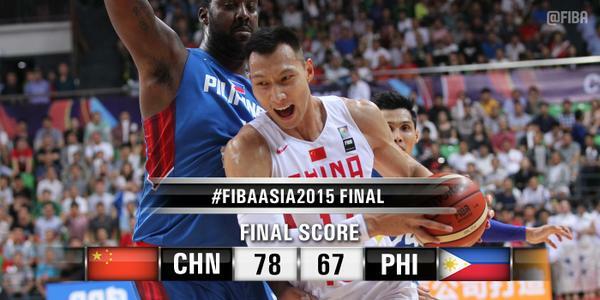 China stretched the lead further, 60 to 44, before the Philippines trimmed it down to 10. Jayson Williams then stole the ball just as China is attempting their final play for the quarter. However, in a sign of things to come, Williams failed to score a basket on the other side of the floor which could have trimmed the deficit to eight going to Q4. The country’s basketball program has achieved tremendous success in the last few years, including back-to-back runner-up finishes in the FIBA Asia Championships and a respectable stint in the 2014 Basketball World Cup. There’s absolutely no reason for us to change course anytime soon, especially since the country remains in contention for one of the three slots during the 2016 Olympics that’s set aside for wildcard qualifiers. Gilas Pilipinas may have failed to win the championship vs China, but we should still be proud of our team because they gave it all in the face of.biased officiating, a hostile crowd, and various dirty tricks.